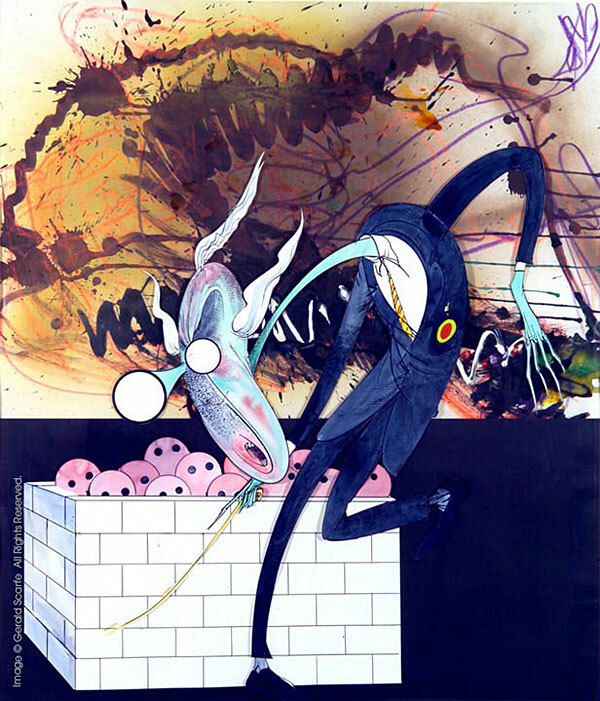 The paintings now being offered have been carefully selected by Scarfe as his most important works, and include several of the most famous images in rock history due to their association with The Wall. Among the paintings are the true definitive originals for iconic artworks such as The Scream, Wife With Flaming Hair, Giant Judge & Hammers, The Mother, Education For What? No Jobs!, The Wife's Shadow, One of The Frightened Ones, The Gross Inflatable Pig, Comfortably Numb, and The Teacher, as well as the massive original storyboard created for the film which incorporates 50 original renderings. 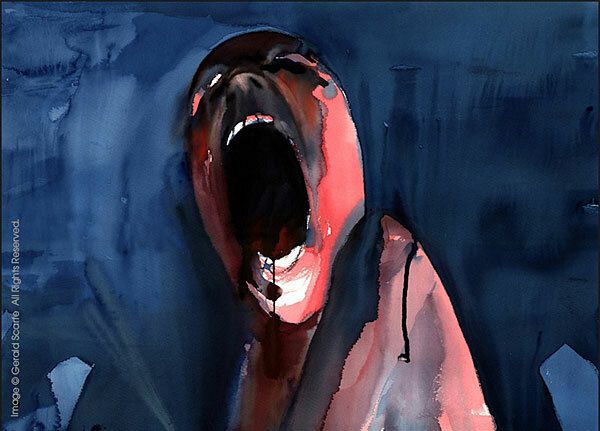 Gerald Scarfe is one of the world's most famous political cartoonists and caricaturists whose work has been seen in The Sunday Times and The New Yorker for decades. His artworks reside in the following permanent collections, among others: Tate Gallery, National Portrait Gallery and The Parliamentary Art Collection in London, as well as the Smithsonian Institution’s National Portrait Gallery in Washington D.C.
To view available artworks, including in-depth descriptions and histories, more info here. PLEASE NOTE: This sweepstakes is for an inviation for two and does NOT include transportation or any other services to and from San Francisco, CA. Please do not enter if you cannot attend this event in person. Well, damn. I live in The City, and I would surely like to attend a private reception. I hope they'll be snacks! Hey, I could take BART there. I'll bring the pizza and barbiturates! and most influential artists would be a high point for me. I really hope to win this amazing prize. The Jane Asher, I'm in! yes, and would like to meet j.Asher...as well. Saw you do the turntable set up in Los Angeles. Second time. You REALLY need a power point presentation. Can I have pudding if i don't eat my meat? I'm up for this, would be a great time. Looks like it will be a hoot ! Does anybody here remember Vera Lynn? 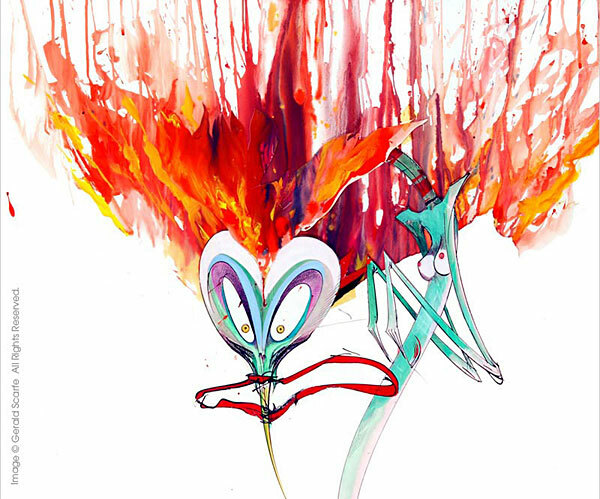 I'd love to meet Mr. Scarfe and his wife - and maybe even buy some art! I've got a pretty good collection of Rock & Roll artwork already, but no Scarfe! Such Epic and Iconic Art! I was fortunate enough to meet Storm Thorgerson there in 2010 and also purchased a large format reprint of Pink Floyd's "A collection of great dance songs", by then Storm's health had deteriorated but he was gracious enough to tell me the story about the days he spent getting that shot and that it was his wife's favorite work. The staff at San Francisco Art Exchange have been very gracious over the years and have been kind enough to show me "the actual, original" artworks for some of Pink floyd's most iconic covers that reside in their archives! The place is a must see for any music lover. I would love to attend this event! I would love to attend. Besides I'm an old Pink Floyd fan that is deserving. Ha please. What awesome images to accompany and enhance one of my all time favorite albums of any genre. Just a nit, but The Wall was released in '79 as opposed to '82. Always enjoyed his art & what can you say about the album that hasn't already been said. My favorite Pink Floyd album. I really want to go to this! comfortably numb. But I'll enter anyway. one miserable morning in black Forty-Four.